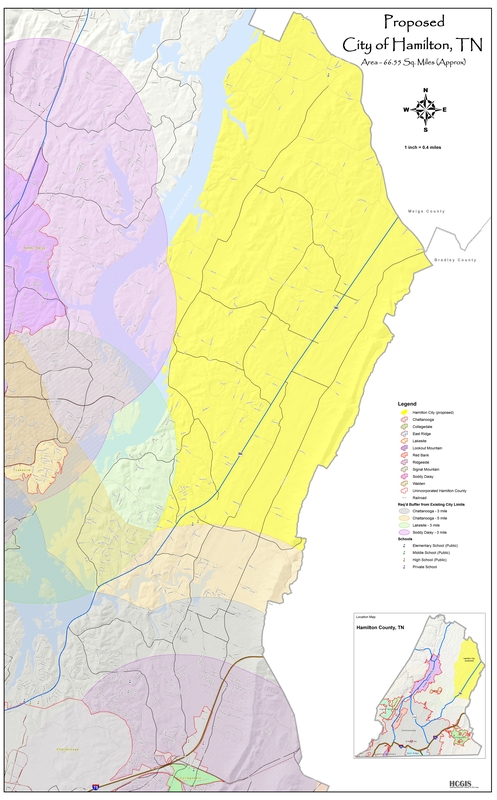 Legal description of boundaries located at bottom of page. To view a large scale high resolution map for City of Hamilton click here. To view the 2003 growth plan click here. Relative to tax map, beginning at the southeast corner with the required 5 miles buffer by State of TN from the 2011 City of Chattanooga city limits (096H), .3 miles, more or less, from east side of Mahan Gap Road and proceeding north along the Hamilton/Bradley county line north-northeast to Highway 60 North (053F); thence proceeding a distance of 8.10 miles, more or less, (north-northwest) following the Hamilton/Bradley/Meigs county line along Highway 60 to Tennessee River (022C); thence proceeding southwest along the contour of the river 6.8 miles, more or less to south border of Soddy Daisy (042M); thence proceeding south along 3 mile buffer contour of Soddy Daisy 2.9 miles, more or less south to TN River (059M); thence continuing south-southwest along the contour of river 2 miles, more or less to Lakesite border (068M); thence continuing south along 3 mile buffer contour of Lakesite 2.4 miles to south of Maple Leaf Lane (094C); thence continuing east along contour of Chattanooga city limits 5 mile boundary to connect at southeast corner of Mahan Gap Road and Hamilton/Bradley county line (096H).